When you want to carry your weapon around in style, what do you do? Get a concealed carry purse, of course. These purses have an additional pocket for your handgun and holster so that you always have it on hand. Before we get started looking at the purses, here are some things that you should know about these concealed carry totes. We know you’ll find the perfect hideaway for your firearm! Style: This refers to the style of the purse overall. There are quite a few different and diverse purse styles on our list, including cross body bags, shoulder purses, and tote bags. Choose your favorite one! 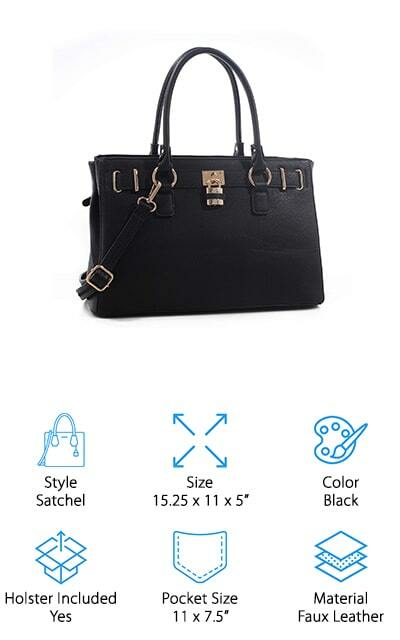 Size: This refers to the overall dimensions of the purse. This will tell you how big it is, what it can hold, and how you can fit things besides your firearm. It’s useful information to have on hand! Color: What color is the purse? Since they are leather purses, the most common colors you will see are brown, black, and tan. Of course, other colors do exist for dyed leathers, but these are frequent. Holster Included: Most of the purses on our list come with a universal holster. This is specifically fit for the purse itself and will hold any weapon that fits between the specifications of the concealed carry pocket. Concealment Pocket Size: The size of the concealment pocket is just as important as the overall size of the purse. This will tell you if your firearm is going to fit in the pocket. Make sure you take a look! 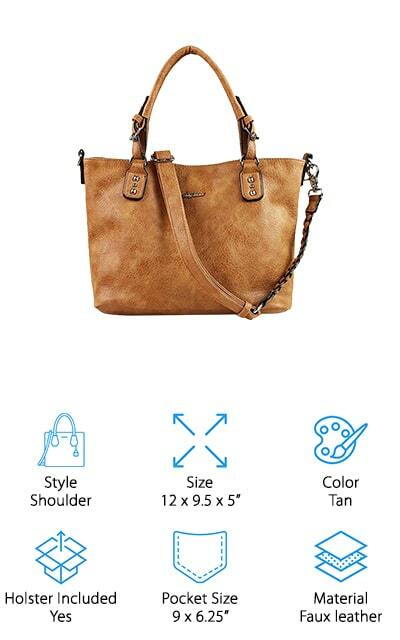 Material: Most of the purses on this list are made of leather, whether that is cowhide, genuine leather, faux leather, or even buffalo leather. You have your pick with this list, so choose your purse wisely! With that information, we can get to our concealed carry purse reviews. We’ve done our research to find the best, most stylish, and highest-quality leather concealed carry purses on the market right now and presented them to make your decision a little easier. The top pick and budget pick are our favorites but stick around for the rest of the list as well. You’ll find your new companion in your adventures to safety! This black leather concealed carry purse is made from genuine cowhide. It’s a beautifully embossed pattern tote bag that will conceal your favorite handgun as long as it’s a standard pistol. An adjustable standard holster will fit in the pocket just fine. It’s a practical purse that’s also beautiful to look at, and no one will suspect that you’re carrying! The Ostrich pattern on this purse is beautiful on fresh leather and will age to a beautifully dark shade that you’re going to love more and more over time. The concealed carry pocket is made of nylon, and there are two open pockets and a zippered pocket in the purse as well. You have the option to wear it as a shoulder bag or across your body, whichever you feel is more comfortable and convenient. It comes with a standard holster with Velcro hooks for a secure fit and natural draw angle. 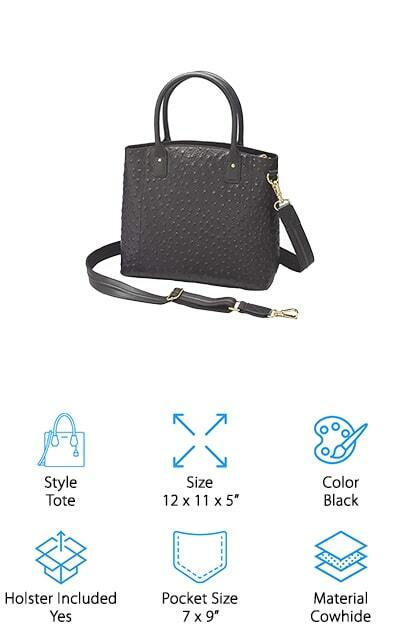 It’s a great bag at a great price! If you’re looking for a more inexpensive concealed carry purse, this is definitely the one for you! 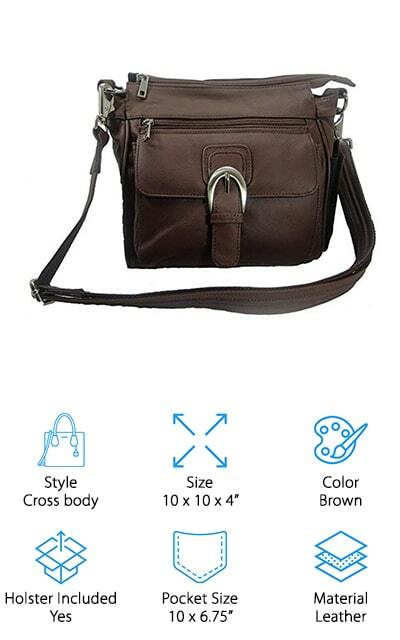 It’s a shoulder bag that you can wear close to you for security. It comes with two YKK zippers on two lockable concealment compartments. There are several other pockets in the purse as well, but these two conceal pockets come with four different keys so you can get at your weapon. 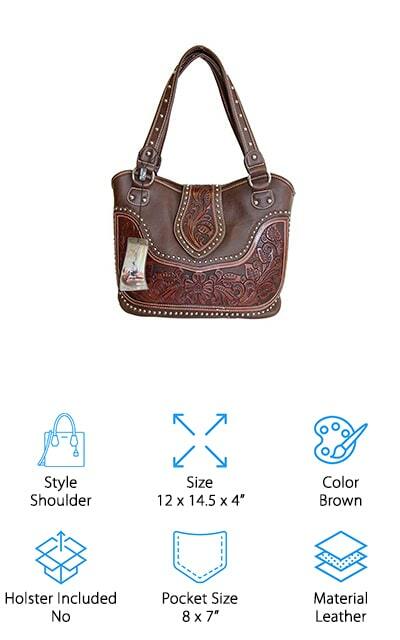 It’s a Roma leather concealed carry purse as well, which you know means that it is high-quality! It comes with a standard Velcro-positioning holster that will fit most small-to-medium sized handguns. There are even pockets on the sides of the purse for extra storage of all of your essentials – either for your weapon or for your life! 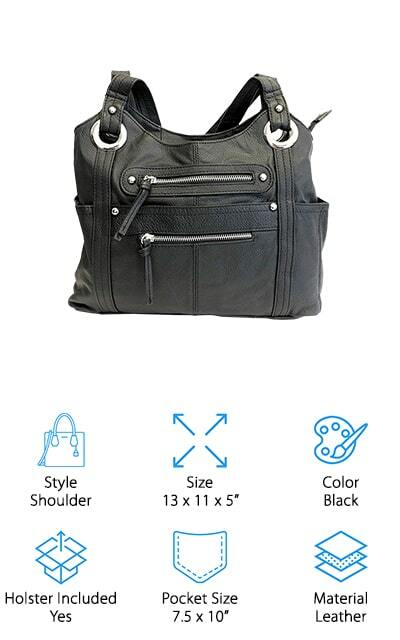 The shoulder strap is covered with silver grommets that make this black purse look stylish and amazing! The purse is 13 inches wide, so you can carry plenty inside! Montana West makes this stylish leather concealed carry purse that you can use for a night out and the protection that you need to get home! The top has a zipper closure with a center flap, and it also closes with a magnet for added protection. There are three inner compartments, the middle of which has a zipper, and a total of two open pockets and another zippered side pocket. There’s enough storage for all of the things that you need to take with you. The handles drop a total of 11.5 inches from your shoulder, so it’s comfortable and will fit right under your arm, but still within reach. If you ever need to set it down, it also has built-in feet that will keep it from flopping over. The concealed handgun pocket is on the back so you can easily reach it. 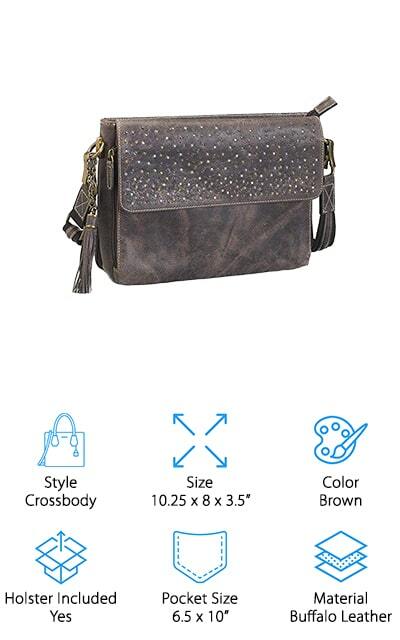 The center flap cover on the front of the purse is decorated with fashionable silver studs. This purse by Browning allows you to reach your holster through the top opening as well as the left and right side openings. We love that it’s super convenient to get to your weapon when you need it! It comes with a keyring so that you can lock the holster and keep your purse safe from little hands and potential threats. There are quite a few inside pockets as well that you can use to organize your purse, so you get more function out of it than just a concealed carry device. The wide base allows the purse to stand on its own so that it doesn’t fall over when you need it to be upright. Plus, the straps are versatile – they are soft and about 10 inches long, so it’s comfortable to carry and they will stay on your shoulder when you need them too. This gray faux leather is simply beautiful, and a nice alternative to brown leather! Lady Conceal’s CCW purse is made of distressed tan faux leather that will look great with any outfit! The main draw of this outfit is a spacious interior that will allow you to carry all of your cargo effortlessly. It’s lined with satin with top zipper access and includes two open pockets and a large zippered pocket, as well as lanyard with a snap for keys. That’s luxury, and it doesn’t get much better! The zippers lock with YKK concealment that you can use either way – they are ambidextrous zippers that come with four keys. There is also a universal holster included for use in the concealment pocket, which measures 9 inches by 6.25 inches. It’s the perfect size for use every day, on special nights and dates as well. Never be caught unprepared with this amazingly spacious and useful purse. Not to mention that it will match just about anything with the light tan color. Roma Leathers is back on our list again with their cowhide leather purse. This stylish brown bag can be securely fashioned across your body so you get a great fit that also has enough space to carry everything that you need. It’s made of high-quality cowhide and you’re definitely going to be able to tell with the rich brown color. It has a front packet with an over flap that closes with a magnet to keep it secure. The front compartment has seven card slots, including an ID window. The gun pocket is on the back side and has two zippers on each side so that you can choose where you’ll draw from depending on whether you are right or left handed. The bag itself is large and spacious, with a main compartment that has three compartments. The middle has a zipper to keep all of your smaller items from getting lost. The body straps are even slash resistant! This Dina Lock Satchel by Emperiaoutfitters is the perfect size for everyday use and has plenty of space for all of your essentials. The concealment pocket is on the very back, separate from the rest of the purse and all of the items that you need to keep secure. 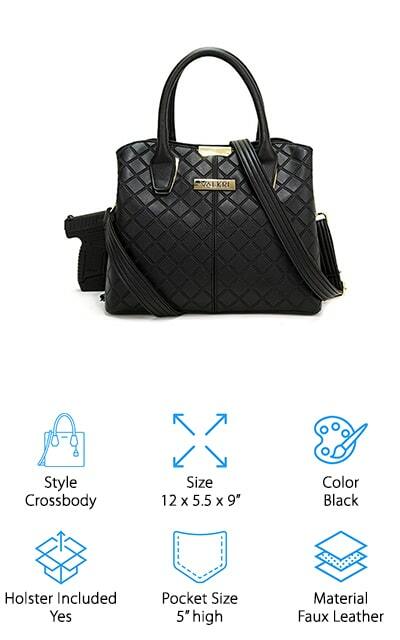 It’s made of beautiful synthetic leather with a zipper closure so that all of your belongings are private. The shoulder strap can be detached and you can carry it by the handle, which drops approximately seven inches when you’re wearing it. It’s also a set that comes with a wallet. The concealment pocket is lockable and has a zipper on each side so you can choose which way you’re going to draw from. It also comes with a removable holster so that you don’t have to buy it separately to tote your handgun around. We love the different ways you can wear this bag, and that it comes with a wallet! Valkri makes this designer concealed carry purse that you can wear just about anywhere! The shoulder straps drop about 24 inches when they are fully extended, and they are reinforced to prevent breakage and resist slashing. The gun compartment has locking zippers, and there is access to the pockets on both sides so you can draw from the right and left side according to your preference. It’s designed for more compact guns. It’s designed to wear across your body to prevent theft and to gain easy access to your weapon. Have we mentioned how stylish this purse is? You’re going to love that you can wear it for a number of different occasions. The embossed checked pattern really adds a touch of class to this handbag. It comes with a Velcro holster to that you can keep your firearm secure inside the pouch. This allows you to be able to smoothly draw your weapon if needed. This purse by GTM is made of buffalo leather. That alone makes it something special! Buffalo hide is some of the toughest, so of course, it’s appropriate that a super tough, stylish purse is made of buffalo hide. There are rivets all across the front flap made of chrome, bronze, and gunmetal to add a nice touch to your purse. The finish is a beautiful, natural distressed brown that’s simply beautiful! The 49-inch strap is adjustable to drop between 12 and 25 inches, and it’s resistant to slashing so it’s anti-theft. The concealment pocket has a zipper on three sides so that you can draw it from wherever you want without being inconvenienced. The inside of the purse is fully lined and zips up from the top, including a side pocket that is open and a zippered privacy pocket. Everything about this purse is stylish and functional, as well as being incredibly tough and wear-resistant. 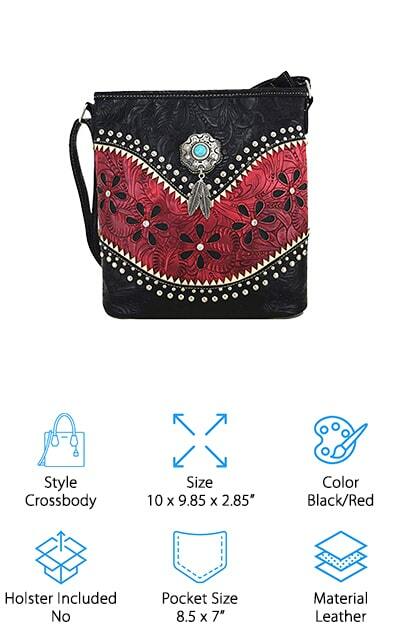 This cross-body purse comes in a great selection of colors and styles. This particular one is black and red leather, and all of the leather is vegan. That means that you can be proud to wear it if you’re vegan as well! The high-quality PU leather won’t wear down on you. 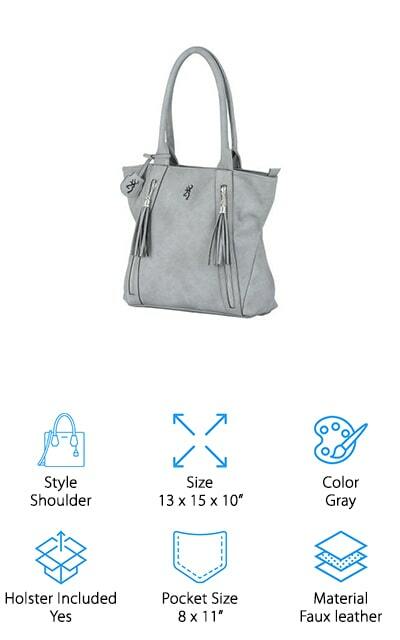 This bag is highly versatile in that you can wear it to work, a night out, and while doing errands in your jeans. It’s the perfect all-purpose bag! The shoulder strap is adjustable so you get just the hang that you want, and the top zips closed for privacy. The concealed pocket is on the back of the bag and carries a gun with the maximum specifications of 8.5-by-7 inches. You can use your own concealed holster in the concealed pocket, which is convenient. The bag’s hardware is silver toned, adding a nice touch to this Western concealed carry purse. We know you’re going to love it!